Discounts available based on length of stay. Our Studio has ceramic tiled floors and a large porcelain tiled shower. All the ceiling areas have been filled with insulation and faced with 2-ply bamboo. Our studio is located at Sandpiper Village I. The Sandpiper grounds boast beautiful mature landscaping and a recently renovated pool complex with a large tile-bottomed pool plus a good size jacuzzi and two Webber gas grills. My studio is less than a minute walk to the pool. Kauai is an island of unequaled beauty and discovery. No matter how often you return, and you will return, you will continue to uncover her hidden secrets of secluded beaches, multi-level waterfalls, and soul pleasing vistas. You will discover that you had not chosen Kauai, Kauai had chosen you! 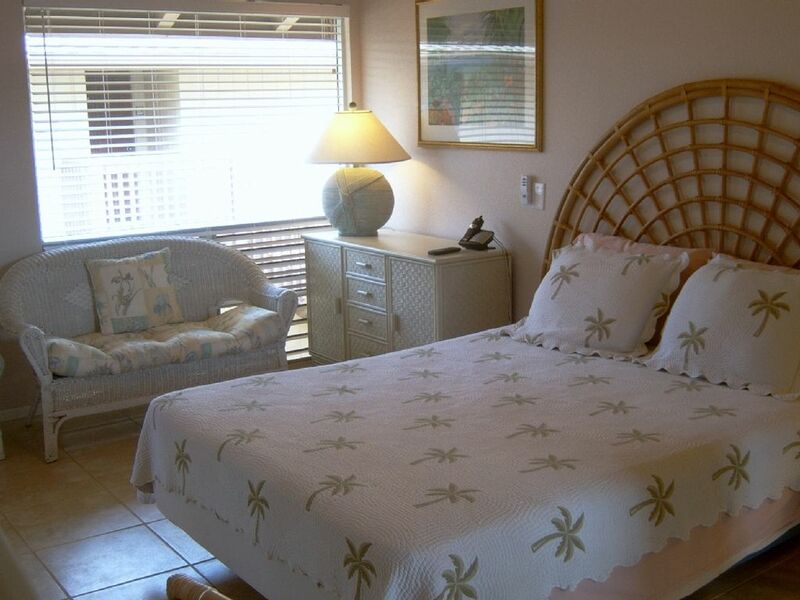 STUDIO AMENITIES - Phone, Cable TV, VCR, DVD Player, Stereo, Clock/Radio, CD Player, Microwave Oven, Full Size Refrigerator, Hair Dryer, Coffee Maker, Toaster Oven, Ceiling Fan, Dishes, Flatware, Glasses, Linens/Towels, Soap, Shampoo/Conditioner, Large Private Lanai. Sandpiper Village is centrally located within the Princeville Resort among other condo units and single family homes. There is on-site parking at no additional cost and you're no more than minutes away from dozens of different beaches, hiking trails, and wondrous vistas. You are less than a mile away from The Princeville Shopping Center anchored by Foodland, a full size super market. Bath & Shower are tiled. Clean and comfortable. Great location in Princeville. Close to the walking paths. Hot tub, bbq and pool areas were a real bonus. Depending on time of day finding a parking spot was an adventure. Karl was great to deal with. Will definitely come back again. Appartement with all what we need: kitchen, balcon. We have acces to the swimming pool. Great location to see the north of Kauai!! First of all, the bed was extremely comfortable and we both slept great. It also helped that the windows and doors were screened, which allowed us to keep them open at night for great air flow, which, along with the ceiling and floor fan, kept the room at a great temp (it also helped get rid of the musky smell we encountered on arrival). It was nice to have a full sized fridge, but the fridge temperature was too warm and we we're unable to adjust the temperature. There were plenty of dishes and utensils provided, and even though we had to wash the dishes in the bathroom sink, they had a raised faucet on the sink, which made it easy to do the dishes. Shampoo, conditioner, and body wash were provided and they smelled amazing. They also provided bathroom and beach towels, but if we had stayed longer than 5 nights, we would've needed more towels. During our stay, we didn't have any noise issues and were surprised to not hear roosters every morning. We enjoyed being able to walk to Hideaways beach (since that beach really doesn't have parking) and suggest you try snorkeling there. It's also walking distance to Queen's Bath, which is a must see (often see many many sea turtles). Overall, the price was good, and the place met our expectations and we would do it again. A very comfortable and no-frills place to stay. We were able to cook every night and eat a simple breakfast and prepare lunches in the kitchenette. The BBQ at the pool is available after 7:30pm (due to other families BBQ'ing) but closes at 8:00pm. This leaves a narrow window but one which we were able to negotiate most nights of our stay. Parking is problematic, but this is why the studio is so cheap. Overall a great place to stay on Kauai! Took several attempts to receive our check in information. Room was basic and clean enough. Ceiling fan didn't work. If you rent this place you'll be in a convenient North shore location but while there you'll hear every word and cough and baby cry of your neighbors and they'll hear you. Kauai is very expensive so I'm glad we were able to save $ on this basic accommodation. The unit was convenient both for walking to Princeville marketplace and also for driving just about anywhere on the north shore. Aloha James and thank you for staying at my studio for your Kauai visit and for your review. I do hope you will consider staying with us again. A full range of incomparable water activities are just minutes away. These include snorkeling, board and body surfing, windsailing, river and ocean kayaking, scuba diving, ocean tours, or just plain swimming. If a dry day appeals to you, a hike on the Kalalau Trail, along the Na Pali Coast reveals unparalleled vistas of ocean, mountains, waterfalls, and sheer cliffs that will stay with you forever.And if golf is your game, Princeville is the home of two world-class golf courses; the Maikai course and the Prince course, ranked # 1 in Hawaii by Golf Magazine. Both courses offer discounts to guests staying at the Princeville Resort. Kauai is an island of unequaled beauty and discovery. No matter how often you return, and you will return, you will continue to uncover her hidden secrets of secluded beaches, multi-level waterfalls and soul pleasing vistas.